When I took my first fiction writing course in college, the professor compared our weekly writing assignments to a contest. On Mondays, we received a word count and a theme. During class time, each of us roadmapped a perfect plot, played with character development, created a distinct mood. On Friday, we handed our (usually) handwritten stories to the person on our left for their consumption (or condemnation, depending on the student). Occasionally, we'd read aloud to the rest of the class. By the following Monday, professor would select a winning story of the week and share it with us. I never won. But, this method of instruction - hours filled with nothing but writing and honing the craft - provided one of the greatest lessons about the writing contests: competition develops writing skills. Guidelines offer focus. Writing within parameters forces you to focus on your message. Word baggage is eliminated and the piece forms a tightly-written story. A theme provides focus, but it does not limit your imagination. Creativity in plot and word choice are limitless! Even genre-specific contests let you stretch your writing prowess by crafting a new world or twisting history. Attitude is everything. Did I stop writing when I didn't win in class? Heck, no. I never gave up. Instead, the competition and my lack of "prized success" pushed me to develop my craft by tuning in to what wasn't working in my stories. I never viewed those works as failures. They just weren't what the instructor was looking for. A positive attitude makes a difference, and I was positive to continue trying! Contests give writers permission to write. If you're set on entering a contest, you've given yourself permission to schedule time to write. Sometimes outside forces control the amount of time we dedicate to our craft, but knowing you have a deadline and plan to enter your best work gives you the say-so to make time to write. Writing increases confidence. 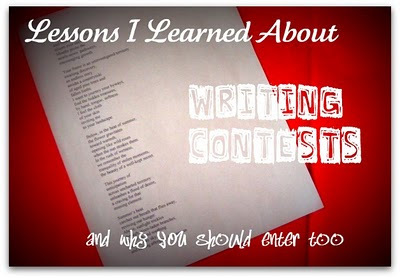 I've entered several poetry contests and I've experienced some success. It's a confidence boost! Even when I didn't win the grand prize, I made fantastic discoveries: what judges are looking for, what writing styles do or don't work, how other writers approach the challenge. These lessons also boost belief in my work. Entering a writing contest may be a big step for a writer, but it's an action that will enhance your writing. Excellent points, LuAnn! I'm big on entering contests, for many of the reasons you stated. But I'll share another of my reasons for doing so: When you enter a state writer's contest (many states have writing associations), the entry fees are minimal, and you're helping that writing organization grow and provide services to their members. And P.S. You might even win. WHeee! Very true! Nothing like a deadline and the fear of public scrutiny to crack on and bash a piece of writing into a respectable sort of shape. Writing groups and courses can have a similar effect, don't you think? I entered and won a few contests. It is indeed very satisfying, but not as fulfilling as the journey. 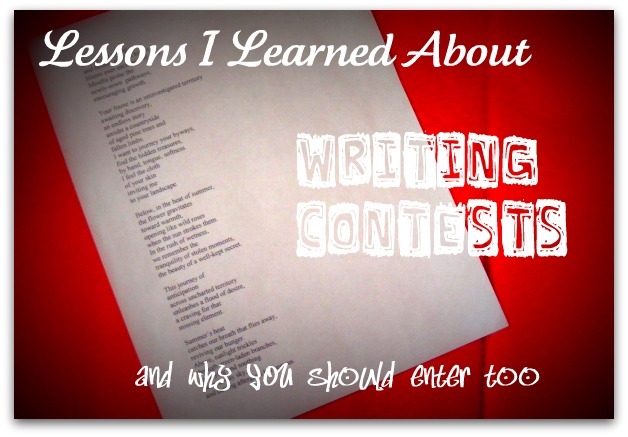 I've been writing for about 4 years and just in the past 2 weeks, started entering contests. I cannot believe how inspiring it is. It is so good for honing the craft, as you said. I find competitions very inspiring, although I prefer no theme. It's a way of participating too, being out there. My stories have been short-listed a few times and that's a great spur to go that bit better next time. Some organisers publish the top 20, or top 10 stories too and that can be your first publication - huge boost. A stimulating post, thank you. I entered my first contest, WOW's Winter Flash Fiction and was notified that I had made the first cut. To me, it was a validation that I am a writer. Even if I progress no further in the contest, it was an incredible boost to my confidence.